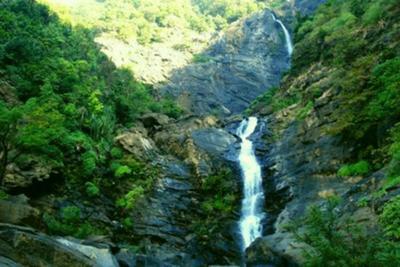 One fine Sunday I & my friend Ashok started on journey to Koosalli Falls. 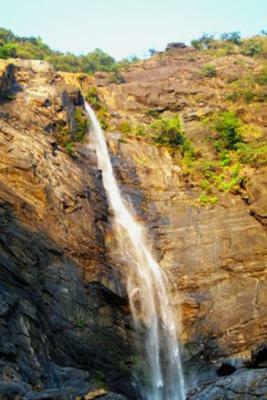 This falls is near Shiroor (Kundapurtq). Both of us didn’t know the way. I had a news paper cutting which contained an article written by Dinesh Holla & had some guidelines from my friend. All the information reveals is that the route may be tough. (But now the time has changed. There is a clear way to the falls). When we find the river, we started walking by the side of the river. It is horrible experience to walk without knowing the distance. At last we reached the falls. When we crossed the 1st stage, we were able to see the the water falling from very high end. But here also very tough root faced by us to reach the 2nd step. But there we enjoyed it a lot & swam for some time. Then we got ready for the 3rd step, which was very dangerous. Without rope it is very difficult to climb the rock. But we climbed without rope, after we failed to find a alternate route. Only because of Ahok’s effort & Guidelines did I succeed to reach. After crossing 3rd step with beautiful pond & scenery, we find another 2 small falls, which we have crossed easily to reach 6th step. At final step we find a big pond, which we failed to see the bottom. It is nice experience as only two of us went to this great & dangerous falls sucessfully & we come back with beautiful memories…. After that I went to this falls several times & stayed night also. 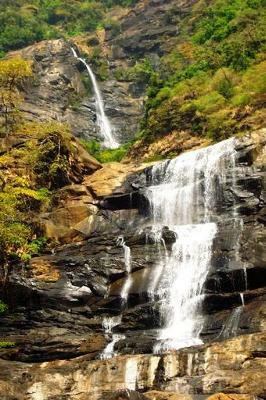 Finally, I would like to say that if we came another route (Bhatkal – Joga), we will see another step which is called as Gudana Gundi & for trek lovers also one falls is there i.e Kudumary falls.